Those are awesome – the Husband would love these. If you’re wondering why I always say “the husband” and not ME, it’s because I can’t eat them. Boooo – however, I can be inspired to make a gluten free/vegan version! Wahoo! I want to make those! Those look so good and with out all of the preservatives in cheese it’s, so clearly you can eat even more! I laugh out loud every time Mr. How Sweet is mentioned. I love your stories of him. He is ridiculous, and endearing. And you are so tolerant, and easy-going! haha! He is lucky he found someone so wonderful, and talented (I need a cheese straw, at 6 a.m.) to put up with his antics!! So cute!! We have family friends who give us homemade cheese straws EVERY Christmas, and they are so good! Oh man. I gotta make these things. Can you use plain flour? Yep, you can use all-purpose! Oh goodness we adore cheese straws. Seriously there are jars of them all over the house around the holidays…we must try these! I might just have to give these another try! I made batch a while back and it was a fiasco! They were dry, too spicy, and I broke my cookie press trying to make wafers with the dough! Ugh! This looks much easier and tastier! I love how they accidentally got a ribbon like. So cool! I hide whole wheat flour in everything – some people are just scared by the word whole wheat flour, but really so much of the time you can’t even tell the different. My friend Chelsea recently posted a similiar recipe and I thought that ws impressive- I love your wiggly ones! These look awesomeeeeee. Cheez-Its are one of my favorite snack foods. Love that these have WW flour! Another day and another wonderful recipe! How fif you know I loved cheese so much! I love the effect from the wire racks. I think it gives the effect of crinkle cut french fries. So cute! these look too easy and too good to be true! I should make these and impress the fam! these look fantastic! so cute too! I think making crackers gave me more courage to do these too. Def going on my to-make list! What a clever way to crickle the straws! They look goooood! DELICIOUS on top of a salad or by themselves!i love that crinkle effect! you would never know that it was an accident! I have never heard of such things, but anything like a Cheez It is okay with me! I had only heard of them recently too! Those look great. I’ve had a craving for Cheez-Its lately. I fully expect a sleeve update! I think the broken bits would look great on a salad. 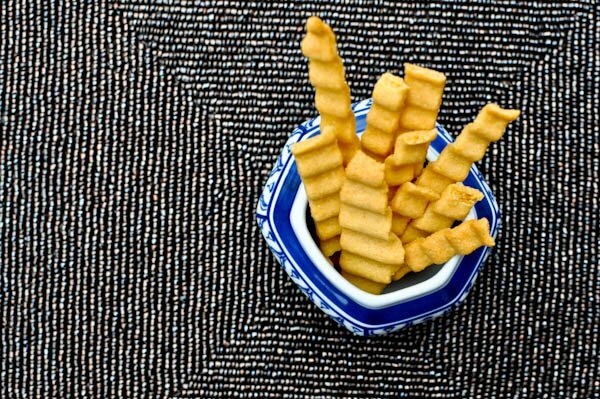 I love how they look in the jar, the waviness of them make them look almost like fries. Didn’t think of that! They do! What a serendipitous discovery to create “crinkle”-cut cheese straws! They look fantastic. Those are so cute, especially with the little crinkles in them!! And I totally agree on the bit about the rejects :) Have a great day Jess! Our food processor is tiny (mini-Cuisinart). Any way to make these without a processor? I’d love to have a cheesy snack to cut the sweetness of all our holiday baking! You could try a blender, or even just mixing the dough in a bowl and cutting in the butter with 2 knives. How cute I love the little crinkles! Oh these look incredible! They look profesional..those crinkles look like they’d be so difficult to do when looking at the finished product but they came from such an easy concept. How cool! I’ve never had these before, I’ll have to give them a try! Yes – so simple and just an accident. You must try! Trader Joe’s sells these Cheddar Cheesesticks, although I think phyllo dough is used as well, but heck these are simple enough to make if you have flour and shredded cheese in your pantry and seriously who doesnt?! Speaking of phyllo dough.. I want to make a late night snack Christmas Eve involving phyllo dough and cheese and meat… like instead of an apple turnover a cheesy/meaty log. Thoughts? Recipes? That’s so cool! I love the squigglyness. Yes, squigglyness. I love the squigglyness too. And the word squigglyness. this is a great recipe! I would love these, yum! Ok, holy yum!! Adding this to my Christmas Day meal list!!! Using the wire rack was a VERY happy accident– they look so fun in all their waviness! When you’ll end up to amaze me?!?!? For sure I will try these cheese straws! You had me at Cheez Its on a stick..must make these now! Actually I am hosting Christmas Eve at my house this year and I was trying to think of things to have out to much on besides standards like nuts and preztels…this is perfect and very timely. Thanks girl! Kinda reminds me of making homemade noodles, only you bake them instead of boiling. Neato. You had me at Cheez-Its! I will be trying these soon. Yummy. I love the crinkly effect. I also admire that you tested and retested the snickerdoodle recipe. I think that’s always the challenge about putting recipes out. If they don’t work, readers will tell you right away.